Indiana is one of the East North Central states of the US. The state of IN covers a total area of 36,418 sq. miles. 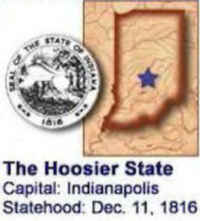 The bordering states of Indiana are Kentucky, Ohio, Michigan, and Illinois. 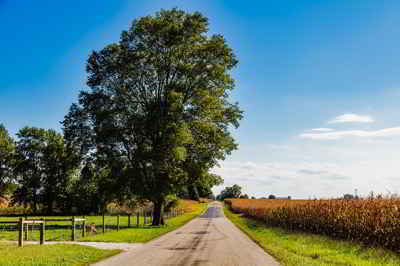 Indiana was the name given to the Indiana Territory by the United States Congress when Indiana was created from the Northwest Territory in 1800. It means "Land of Indians." Manufacturing became the chief economic activity of Indiana in the early 20th century, but at the start of the 1990s the state was also a major producer of farm commodities, especially corn, soybeans, and hogs. Indianapolis, the capital, and Gary were big industrial centers. Indiana's 41-mile Lake Michigan waterfront- one of the world's great industrial centers- turns out iron, steel, and oil products. Products include automobile parts and accessories, mobile homes and recreational vehicles, truck and bus bodies, aircraft engines, farm machinery, and fabricated structural steel. Wood office furniture and pharmaceuticals are also manufactured. Much of the building limestone used in the US is quarried in Indiana, which is also a large producer of coal. Other mineral commodities include crushed stone, cement, and sand and gravel. Indiana has hot summers and cold winters, with fairly high humidity. The combination of warm temperatures and high humidity can make July and early August a bit uncomfortable, particularly in the southern parts of the state. Temperatures can climb to the high 90s F/mid 30s C. Expect late spring and fall temperatures to range from a low of 40 F/4 C to a high of 65 F/19 C. A sweater or jacket will be needed in the evenings. Those visiting in winter will find plenty of snow - as much as 40 in/102 cm falls near Lake Michigan. January temperatures average 16 to 41 F/-14 to 5 C.
Some of Indiana's most popular attractions include Amish Country, College Football Hall of Fame, Lincoln's Boyhood Log Cabin home, Indiana Dunes, Indianapolis Motor Speedway and museum, the southern Indiana caves and waterfalls, West Baden and French Lick are well known for their mineral springs, and Tippecanoe Battlefield Memorial Park. 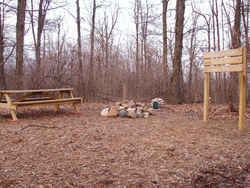 The highest point in Indiana is Hoosier Hill in Franklin Township at 1,257 feet above sea level. The highpoint is in Wayne County - about 10 miles north of I-70. Total Area 36,417.73 sq. mi. Land Area 35,866.90 sq. mi. Water Area 550.83 sq. mi.